And we all know that It happens. But never-the-less it is discouraging!!! As farmers we have had to learn the lesson that things are out of our control over and over again. It’s good to remember where we started and how far we’ve come in the past 10 years. There is hope in our farm’s story just as hope is here that spring will really come again! Once upon a time at a Maine liberal arts college in the early 2000’s, the two of us met. Here’s where unlikely started. I was a girl from the suburbs of Austin, Texas and I couldn’t tell you the first thing about farming. Milk and veggies came from the grocery store, right?! Gene was a rural Maine boy from Washington County with the inkling of a dream to live and work on the land. My roommate roped me into doing a CSA farm share program that had a work share component to it. I went to a real farm once a week and actually got my hands dirty. Saw a glimpse of what a real farm was. And pretty quickly I was hooked. “Hey, this is fun. This is rewarding and fulfilling. I could see myself doing this,” I remember thinking. Meanwhile Gene studied abroad in Thailand and lived and worked with rice farmers there. He saw the power that their local agriculture movement held to combat the rural out-migration also rampant in the young people in Thailand. This is just like Maine, Gene thought. It was then and there that he resolved that farming was where his work was. But how to make this dream a reality with little experience and no land? Together we decided we should formally pursue training in the kind of community farming that we both held as our reason for farming. That meant finding a Community Supported Agriculture (CSA) farm to apprentice on. That’s where Gene swooped in with his building skills and helped to build us a tiny 180 square foot cabin to live in on the farm’s property. Think, tiny living, before tiny living was in! Wait, did you say 180 square feet? That’s smaller than our bedroom now! But we were young and we made it work! For two seasons, even through the winter! Guess that’s how we knew we could make anything work, so we got married. 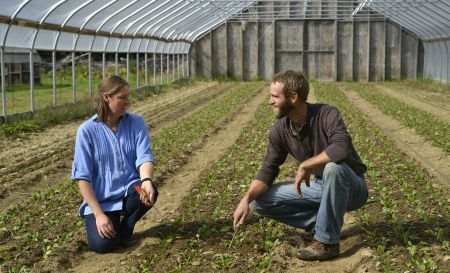 Training on a CSA farm was important for both of us, because that was what we saw our future farm being focused around eventually. Ah, that first year there were so many Challenges, that I wanted to quit then and there! But starting at the beginning, we were thrilled that our little dream was coming true. We had found a place to rent and start our own farm in Waldo County. This was 2009. Anyone remember that year? If you don’t, don’t worry, I’ll remind you. We remember it well. It was the summer where the sun did not shine and the rain did not stop. We also were breaking our gardens out of sod. Which did not die. This had us picking up chunks of grass sod and taking them out of the field one wheelbarrow full at a time. August brought the first days of sunshine of the whole growing season, and we were elated. Things were going to change for the better, right? We were convinced. Then going out to the fields we saw our very first ripe cherry tomatoes! YUM! You know those little bright orange cheerful ‘Sungolds’? They are the taste of summer! Not to go too far into painful heartbreaking details here, but we realized that we had the disease called Late Blight. We watched Late Blight devastate our entire tomato crop in a matter of days before it had a chance to fully ripen. Ah yes, another lesson that farming can be out of your control. It was the sheer hard realities of our first year of farming on our own that sunk a little niggling question into me. Was this whole farming thing right for us? Could we really make a go of it? By late fall I was literally telling Gene that we would be better off quitting the farm and him getting a job at MacDonalds (or anywhere!) than continuing on the way we were. Meanwhile we had been looking for the right place to sink down roots for over two years. To no avail. Either we were too picky or the right place really hadn’t come across our path. As soon as Gene got up in the fields he went prancing off through the tall Timothy grass and red clover hay crop that grew here that year. “I love it!” he said to me, eyes shining, the instant we were back in the car. This was it! So we bought what is now our home and farm of almost 10 years and moved in determined to start all over on the right foot after a tough first year. I guess we hadn’t learned our lesson from our first year. There we were again picking grass sods that weren’t dead into a wheelbarrow. For one acre of crops! OMG not an easy or fun task! “I can’t do this unless we get a tractor,” I told Gene. And we did that year! Now even Gene admits it was the best thing we ever did and we still use and love it today. The next year we tackled putting up our first high tunnel. Those things are a blessing on the farm, once they’re up! But putting it up was much more difficult than we had anticipated. Our goal of an autumn completion stretched out until we found ourselves finally on a mild day in mid-December getting ready to put the plastic on. Just the two of us to unroll and secure it, while the slightest breath of wind would set the whole massive 110 pound sheet of plastic flapping like a huge sail. Phew! Got it done working fast and deep into the early dusk of that December afternoon, but nothing less than very challenging. In July of 2011, we packed our very first Summer CSA shares for our founding 16 members. That was a good feeling. We were heading in the right direction towards our dream. Then there were a few more years of getting Late Blight and losing our tomatoes and potatoes. Then a humid August and our 4000+ heads of garlic rotted while curing. Nevertheless we stuck with it. And the challenges didn’t let up, but neither did our persistence as farmers, nor our steady successes in moving towards our original goal. We wanted to get to the point of having a community farm that supported our family. Having a Community Supported Agriculture (CSA) farm share program that supported our farm and supported our community. That was where our dream to begin farming began after all. And that’s where we were heading, no matter how many farmers markets or wholesale shipments we had to do to get there. 10 years later, one toddler later, and with another baby on the way, many things have changed. Many things out of our control have been weathered. And as of this year, we’ve gotten to our goal of being purely a community farm. We’ve still got our farm, our marriage, have a beautiful growing family and wonderful support from hundreds of local families through our Community Supported Agriculture (CSA) farm share program. But still every year, all the time, there are things out of our control. Like mid-April snow storms… and who knows what’s to come! But with the incredible support of our CSA members and friends of the farm, I say, bring on the next ten years! Atlantic magazine's back page is devoted to a question for readers.My response to the question:What is the greatest act of courage? Was choosing to be a farmer.I can't think of many things that take more courage and sheer optimism.I'm so grateful you guys are here and it's such a pleasure watching your beautiful family grow. Love your story. Lots of challenges along the way. Your CSA is such a wonderful addition to the surrounding community. Yes, this winter has been so cold, lots of snow, and an April snow when we yearn for warm weather and spring flowers. I so want to sit on the front porch with my morning coffee and soak up the sun! I was away for your first spring offering of vegetables visiting my 99 year old father in PA., but yesterday purchased a bag of young kale at Spruce Mill, grown on Ripley Farm. I couldn't wait to get back to Maine which looked better and better even with the snow on the ground, and Bill and I look forward to this summers CSA with Ripley Farm. You and your farm are truly inspirational! From a consumer standpoint you make it all look easy. Everything is beautiful, scrubbed clean, and delicious! Everything (equipment and implements and buildings) on your farm is clean, organized, and neat and inspires confidence that the farm is a well oiled machine. Thank you for all you do to bring us those wonderful CSA boxes summer and winter! What you are doing is incredibly important, Mary Margaret. Bravo. I help out on a 20x50’ garden in Cushing, ME, w all those challenges. Thank you! Your story is so true and so real. Thank you for sharing what you have been through and what keeps you going. Learning to live on the land and with nature is rare today. I love your blog! Congratulations, It has been a joy watching your farm and family grow. The quality that you bring to your work really shows.